Manila, Philippines - The 'Filipino Flash' Nonito Donaire Jr. defeats Vic Darchinyan via technical knock-out TKO at Round 9 on their rematch Saturday night (Sunday morning Philippine Time) held at the American Bank Center in Corpus Christi, Texas. Donaire as seen not doing near well as expected of him in the first 7 rounds, stung Darchinyan with a strong straight to the face and followed it with another blow to the head before sending the Armenian-Australian, Darchinyan to the canvas with his signature left hook with still 1:45 left in the ninth round. 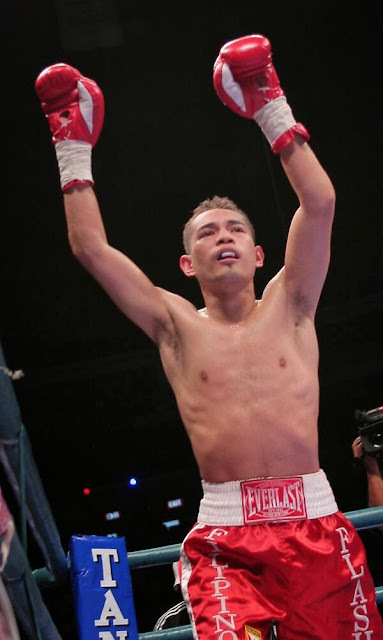 The victory regained for Donaire his stature as one of the world's best pound-for-pound fighter after losing his WBO and WBA super-bantamweight titles to Guillermo Rigondeaux last April. Six years ago, Donaire also knocked down Darchinyan in their first match in Bridgeport, Connecticut. Before the fight today, Donaire said “I don’t really look back. I only look forward – to this fight." Darchinyan is now 37, one of the oldest active boxers. The 30-year-old Filipino boxing superstar dedicates his victory to the Filipinos, to uplift our spirits inspite of calamities. In a Twitter and Facebook post, Donaire said: "Dedicating my fight to uplift the Filipinos spirits. Our indomitable spirit has been recognized WORLDWIDE, even by CNN. Keep faith, HE will not abandon us in our time of need. Continued prayers for the Earthquake and Typhoon victims." In the undercard match on today's battle shows bantamweight "Little" Oscar Cantu (6-0, 1 KO) scoring a six-round unanimous decision over Roberto Ceron (3-1, 1 KO) and undefeated welterweight Alex "El Cholo" Saucedo (11-0, 8 KOs) fashioning out an impressive third-round KO over Steve Hall (6-5, 6 KOs).